Marco Borriello’s slight hope in getting a call up for the Euro 2012 after his move to Juventus simply rises again after the Azzurri’s tactician, Cesare Prandelli, promised that he will give an attention towards Borriello at Juve. Prandelli stated that if the ex-Ac Milan striker can showcase the quality that he possessed during his spell in Turin than getting a spot for the national team isn’t an impossible thing for the attacker. 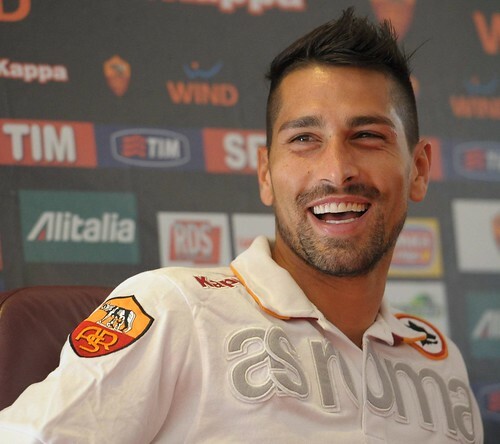 “Borriello is a player with great quality. He’s been a part of the Italy squad before and I’ll watch him over the next few months as I did in the past. I hope that he can find the continuity in his performances at Juventus which he didn’t have at Roma. He’s a complete player and I would have liked to have coached him at club level,” Prandelli said. This news surely is a very exciting one for Borriello as getting into the national team is something that has been growing in his head in the last few seasons as that pretty much what made him opted to move from Milan in the first place. At that time, the former Rossoneri youth product choses to play in the capital despite acknowledging Juventus’ interest simply because the Bianconeri couldn’t offer a certainty for him. However, things seems to be going upside down for the attacker as he couldn’t managed to find consistent playing time in Roma, especially this season, since Luis Enrique arrived carrying his Spanish minded philosophy. Borriello will definitely try to give his best during his short spell in Turin not only to convince the Bianconeri’s management in making his status permanent but also to grab Prandelli’s attention for the upcoming Euro.